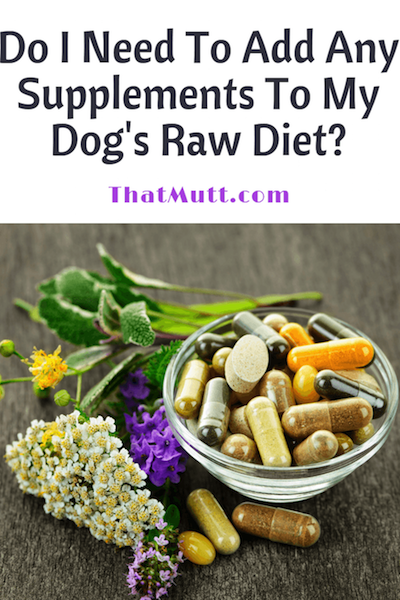 Do I Need To Add Supplements To My Dog’s Raw Diet? Supplements are dietary add-ons to help support good health in our dogs. They either come in synthetic form or as superfoods. I personally became a firm believer in nourishing our dogs’ bodies (and our human ones, too) with superfoods rather than synthetic supplements in late 2014. That’s when my Boxer mix Missy was diagnosed with cancer for the first time, and I began researching alternative ways of boosting her immune system and ways to prevent illnesses from surfacing in her brother Buzz. Although Missy ultimately died of cancer in April 2018, she ended up being in remission from it for 3+ years. I believe that her raw food diet that I supplemented with superfoods contributed to her improved health, and that it’s been keeping her brother Buzz free of illnesses so far (knock on wood). 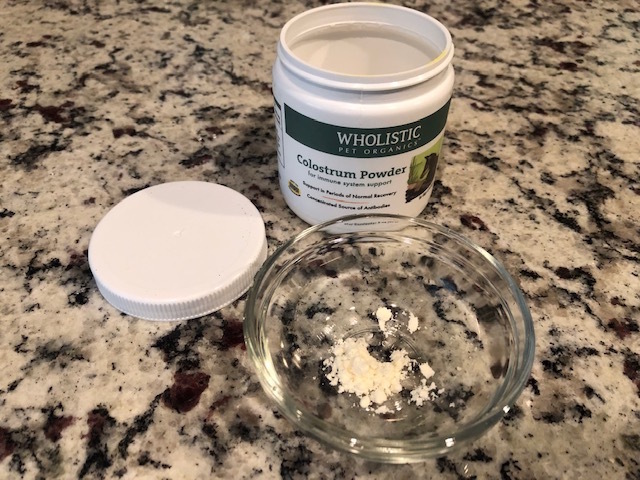 That being said, it’s not necessary to add a cocktail of superfood supplements to your healthy dog’s raw diet as long as the diet is an overall balanced one. 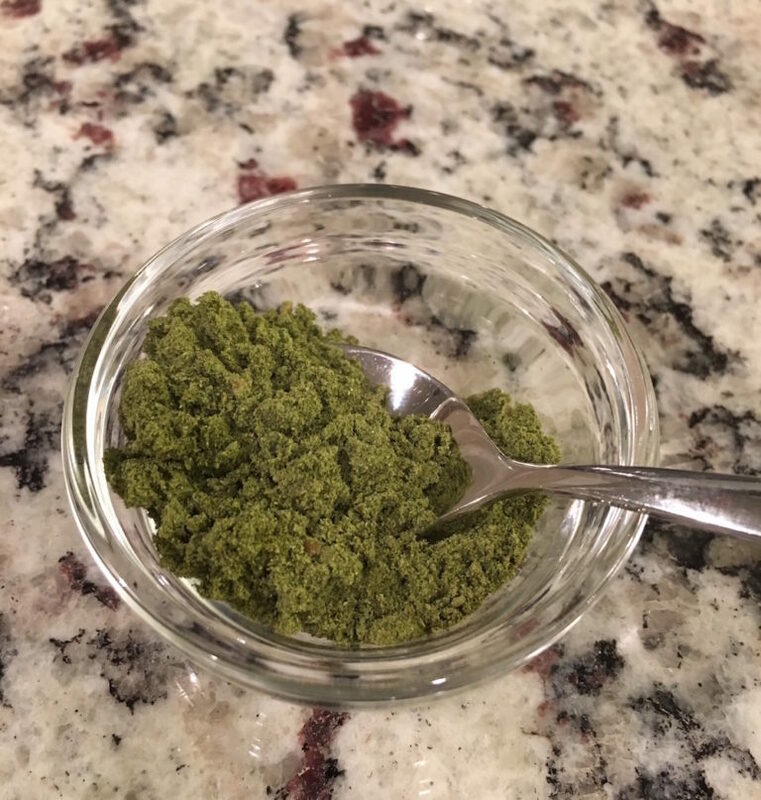 You could pick two and feed them on a daily basis for illness prevention – I’m thinking kelp powder along with bone broth or turmeric paste – and offer others on an as-needed basis during periods of recovery from surgery or illness – such as colostrum powder or hemp oil. Kelp is a seaweed that’s rich in fiber, vitamins, minerals, amino acids, and trace elements. It promotes dental health and fresh doggie breath, is great for skin, digestive and thyroid health, and also helps repel fleas. You can just mix it into your dog’s raw food. Get it here. Raw goat milk is a great source of protein, fatty acids, vitamins, minerals, electrolytes, and trace elements. It acts as a natural probiotic, relieves joint pain, and fights yeast. 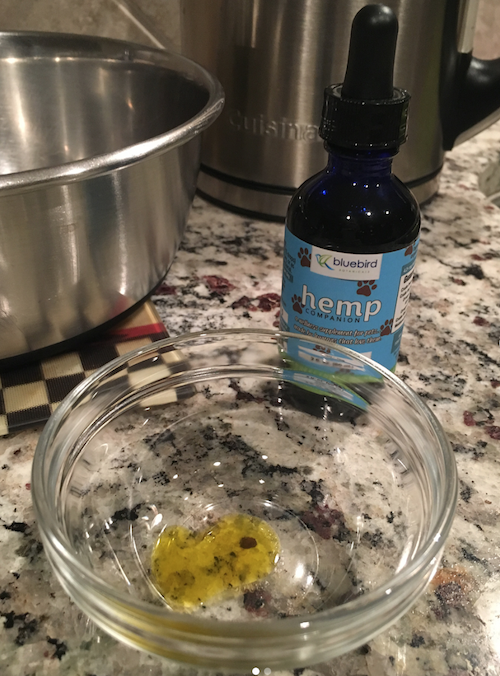 Either pour some into a bowl as an extra liquid treat, or mix it into your dog’s raw food. 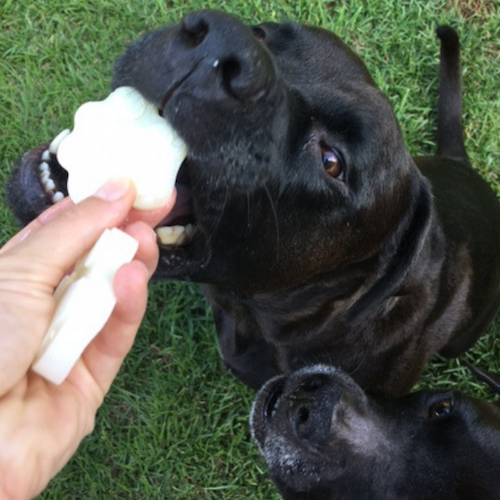 Raw goat milk can also easily be turned into refreshing summer treats – just pour some in silicone molds, freeze overnight and offer them to your pup! Bovine colostrum powder is derived from a mother cow’s first milk shortly after having given birth and is a natural source of concentrated antibodies. Besides its immune system boosting qualities, it’s also an anti-inflammatory, helps battle the symptoms of arthritis and leaky gut, and is used to treat and prevent cancer. Just mix it in with your dog’s raw food. Since it also heals wounds, it can be administered to a dog externally (mixed with distilled water) after surgery as well. Hemp oil is derived from hemp plants. It reduces inflammation and has the perfect ratio of Omega 6 to Omega 3 fatty acids, which makes it great for joint health, coat & skin health, as well as a cancer preventative. Just mix it in with your dog’s raw food. I supplemented my pup Missy’s immune system with it after her second cancer diagnosis this year. I wish I would have known about it back in 2014 when she was first diagnosed with it. Turmeric paste is also known as golden paste. It’s a concoction made of the orange spice turmeric, coconut oil, water, and freshly ground pepper. The ground pepper increases the benefits of the turmeric powder twentyfold, which makes it a powerful anti-inflammatory that’s excellent for joint support. Turmeric paste also has liver-detoxifying benefits, anti-cancer benefits, as well as anti-septic and anti-bacterial benefits. 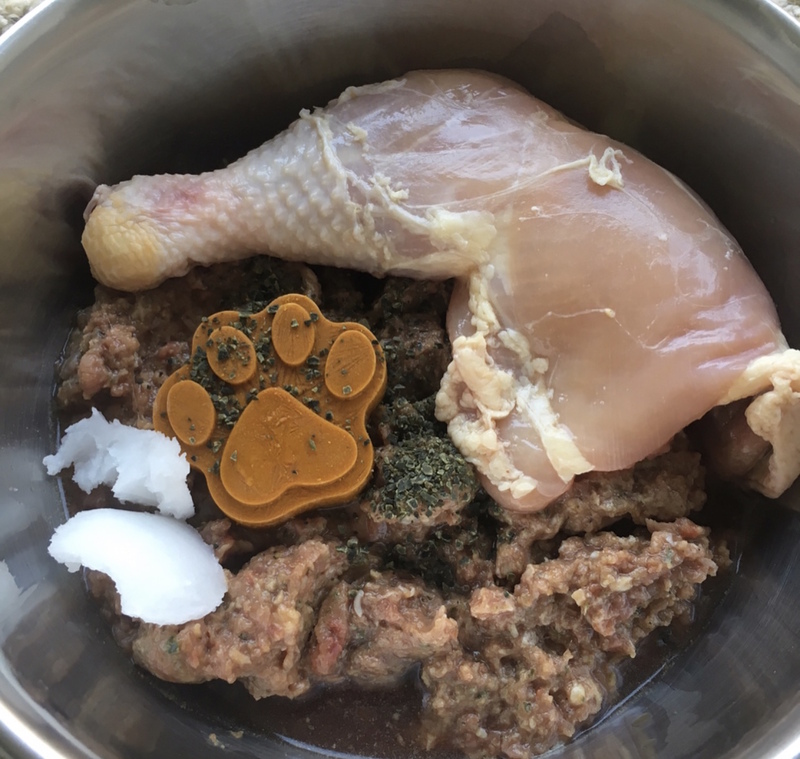 You can mix the liquid paste in with your dog’s raw food or turn it into a frozen treat of sorts like shown in the picture below. Here’s the recipe for my homemade turmeric paste. Bone broth is made from joint bones that are rich in glucosamine and chondroitin, apple cider vinegar or lemon juice, garlic, and some optional veggies and spices. It needs to simmer on low heat for about 24 hours, so it’s best to make it in a crockpot. It’s great for joint health, digestive health, and detoxifies the liver. You can mix it in with your dog’s raw food or offer it as a liquid treat in their bowl. 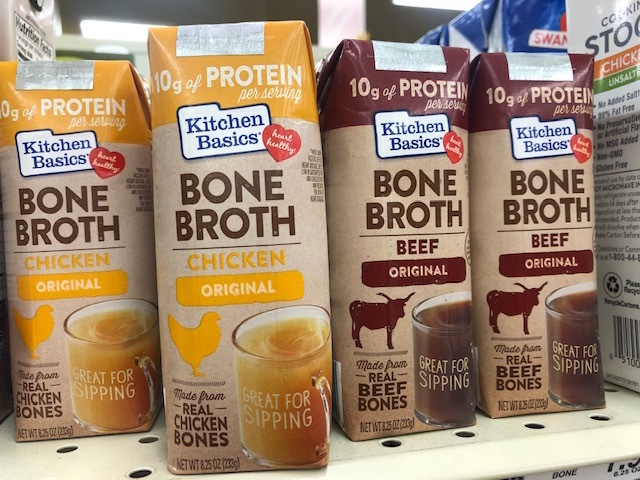 Tip: I recently noticed beef and chicken bone broth at my local grocery store, so you may want to check your grocery store for some if you don’t have the time to make your own. Also check out the brand for dogs called Primalvore. Have you supplemented your dog’s diet with any of these superfoods? Thanks for these! I’m going to check out your recipe for turmeric paste. Do you recommend adding a probiotic to your dog’s food? I’m using one, but I had to experiment a little with which and I use about half the recommended amount because her stomach gets upset on the full amount and she does very well on half. Hi KL, have fun with the turmeric recipe! The raw goat milk acts as a natural probiotic for dogs, so you could try adding some of that to your pup’s meals!